Contains 40 recipes developed just for the NHLBI, with full-color design throughout and original food photographs. The focus is on family-friendly meals and snacks and getting children involved in meal preparation with their caregivers. Dishes such as Baked Eggrolls, Mexican Lasagna, Oatmeal Pecan Waffles, and Wow-y Maui Pasta Salad are sure to please most family members. 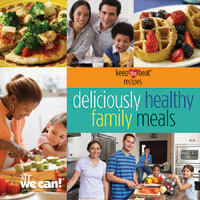 The cookbook also includes information on cooking, nutrition, and feeding children (including picky eaters).